Here’s another version of kibbeh, prepared the Armenian way. It’s a kibbeh of bulgur and fragrant herbs with cooked split yellow lentils. Vospov kofte is a Lenten dish and a perfect option for a light and nutritious summer meal. Armenian cuisine is best known for its soujouk (spicy sausage), mante (meat-filled ravioli in a yogurt sauce), and lahm b’ajin (meat pies), but other Armenian home-cooked dishes such as this are definitely worth discovering. Rinse and drain the lentils, place in a pot and add fresh water to cover, and bring to a boil. Take off the foam when it forms at the surface, and let it simmer for about 30 minutes, until the lentils are very well cooked, mushy, and form a thick paste. Stir occasionally to help break the lentils into a paste. Meanwhile, finely chop the onion. Heat the olive oil in a skillet and sauté the onion until lightly golden. Finely chop the scallions and the parsley. Mix the cooked lentils, cooked onion, scallions, parsley, bulgur, salt, cumin, paprika, and cayenne, and knead everything together to form a homogeneous mix. It must be as thick as a dough, not too runny and not too stiff. If it is too stiff, add few drops of olive oil and water. If it is too runny, let it cool a bit and it should get firmer. For the garnish, finely chop the tomato, cucumber, scallion, pepper, and parsley sprigs and mix all together with the salt and cumin. Season to taste with sumac. 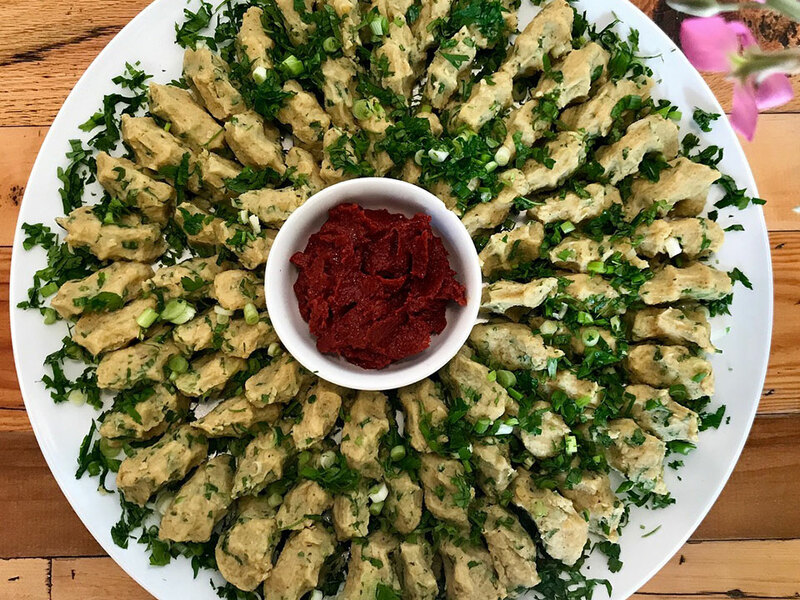 Shape the kibbeh into pieces the size and shape of fingers, garnish with parsley leaves, and serve along with the garnish.